Adjustable Overload from 0.5 - 1.0ln. Adjustable short circuit from 1.5-1 Olr. Inbuilt ground fault pratecbori available 20% to 100% of tn. Provision of theimai memory: OT-J/OFF. 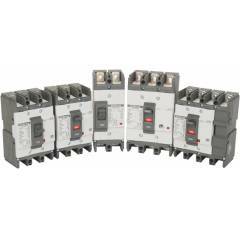 C&S 37 kA Triple Pole New WiNbreak MCCB 150 A is a premium quality MCCB from C&S. Moglix is a well-known ecommerce platform for qualitative range of MCCB. All C&S 37 kA Triple Pole New WiNbreak MCCB 150 A are manufactured by using quality assured material and advanced techniques, which make them up to the standard in this highly challenging field. The materials utilized to manufacture C&S 37 kA Triple Pole New WiNbreak MCCB 150 A, are sourced from the most reliable and official MCCB vendors, chosen after performing detailed market surveys. Thus, C&S products are widely acknowledged in the market for their high quality. We are dedicatedly involved in providing an excellent quality array of C&S MCCB.